Seventy missionaries from the US, Canada, and England push Israelis to 'talk' to them in the comfort of their homes. Seventy missionaries arriving in Israel last week from Canada, the US, and England are going from door to door in central Israeli cities, handing out missionary material, reports the Yad l'achim anti-missionary organization. 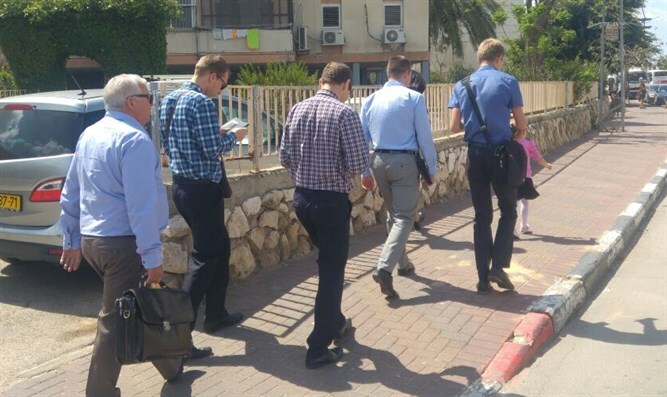 The group, which came on a special trip to for the purpose of missionary efforts, has targeted neighborhoods in Beit Shemesh, Rishon Lezion, Tel Aviv, Kiryat Malakhi, Rehovot, and other cities. Missionary work is only illegal in Israel if subjects are promised any form of material gain or are minors. According to the Yad L'achim organization, the missionaries stand on street corners in pairs. One person in each pair is from abroad, and the other is local and Hebrew-speaking. Many citizens turned to Yad L'achim reporting that the missionaries asked to visit homes to speak to residents. Yad L'achim volunteers around the country were sent to each of the places targeted by the missionaries. The organization also warned Israelis of the dangers posed by the group, which operates using deceptive tactics and with missionizing intent. "In each of these cases, we prevented the continuation of the missionaries' activities, and caused the missionaries to return to their centers bitterly disappointed," Yad L'achim said in a statement. "We still need the public's help and awareness, and we need them to inform us of any suspected missionary activities." Yad L'achim's has activated a 24-hour hotline to report the sighting of any such activity: 1800-620-640.